Being a Grandfather. . . .
. . . . is wonderful. Here is Eve and me. Eve has just finished playing Beethoven’s amazingly complex “Sonata Hammerklavier Opus 106.” She missed perhaps four notes in the third movement’s adagio sostenuto (those darn F sharps). This photo shows how she is delighted with her performance. 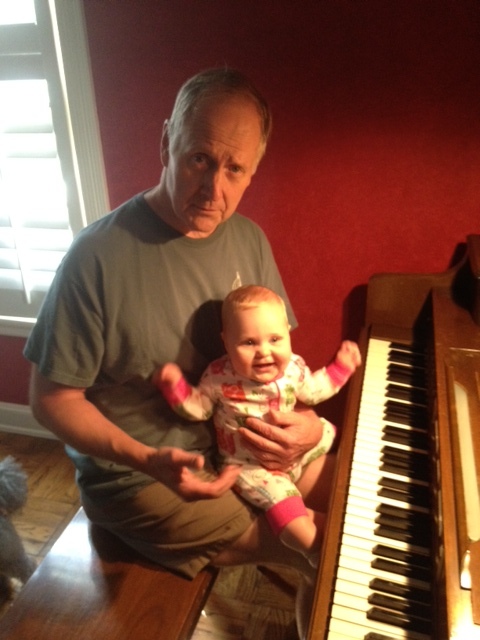 . . .and the proud conductor’s approval. . . .
Scott, isn’t it amazing how your daily worries and troubles melt away when you are holding and playing with your Grandchild? They are truly God’s gift to us. I am glad you are close and able to enjoy such a precious Grandchild. All my very best, Joe. WE ARE SO HAPPY EVE CHANGED HER MAJOR. WE WERE WORRIED SHE WAS LEARNING TO BE A PICK POCKET. Did you send her to bed for four minutes because of her mistakes? Grandfathers tend to be too soft! Don Fagerberg, Founder Ministry Mentors enhances the professional effectiveness of active clergy, strengthens their personal and spiritual health, and affirms their gifts for ministry. http://www.ministrymentors.org Phone: 847-729-1644 NOTICE: This e-mail is from Ministry Mentors and is intended solely for the use of the individual(s) to whom it is addressed. If you believe you received this e-mail in error, please notify the sender immediately, delete the e-mail from your computer, and do not copy or disclose it to anyone else. If you properly received this e-mail you should maintain its contents in confidence in order to preserve the clergy-client, work product privilege, or other applicable privileges that may be available to protect confidentiality.